upstairs laundry room | Knight Construction Design Inc.
Come and see what our award-winning 2015 NARI National Contractor of the Year team can do for you during the Parade of Home’s Fall Remodelers Showcase tour this weekend. 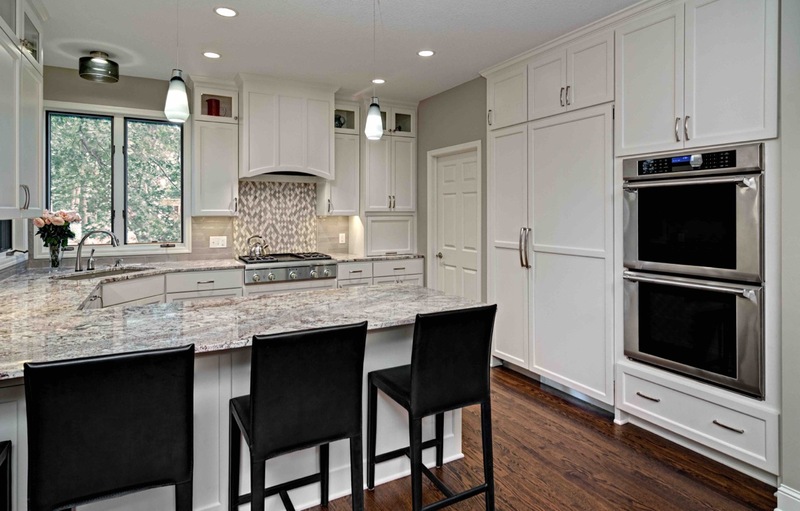 The Showcase features a project Knight completed at 4779 Highcroft Court, Eagan. The extensive renovation of this 90's two-story home fulfilled the family's desire for functionality and design. On the main level, we reconfigured the kitchen and dining room to accommodate a large peninsula and walk-in pantry. We also converted the old laundry into a proper mudroom with custom storage and a tile floor. The home now features a more convenient upstairs laundry. We also updated the master suite with a spa tub and large walk-in shower. The upper landing and staircase feature hardwood flooring and a new custom railing. The Knight Construction Design project is one of 63 remodeled homes on the Remodelers Showcase tour this weekend. Homes can be seen from noon to 6 PM today and tomorrow (Oct 3-4). To reach the Knight showcase home, take Highway 77 to Cliff Road, west on Cliff Road, south on Slater Road, east on Warrick Court, and south on Highcroft Court. Watch for the R-24 sign on the right.